Fran’s photo montage constructions have been exhibited widely, both locally and internationally, and are in many private collections and the permanent collections of the Smithsonian National Air and Space Museum (Washington, D.C.); the Museum of Fine Arts, Houston; The Grace Museum (Texas), and the County Down Museum (NI). Escape Artist: The Art of Fran Forman was published by Schiffer Publishing LTD and was selected as one of the Best Photo Books of 2014 by Elizabeth Avedon and won First Place in an international competition juried by 21st Editions. 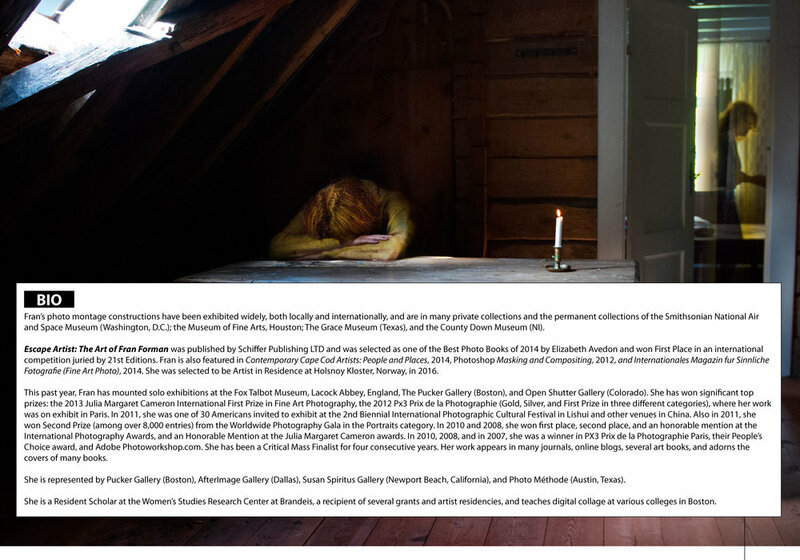 Fran is also featured in Contemporary Cape Cod Artists: People and Places, 2014, Photoshop Masking and Compositing, 2012, and Internationales Magazin fur Sinnliche Fotografie (Fine Art Photo), 2014. She was selected to be Artist in Residence at Holsnoy Kloster, Norway, in 2016. This past year, Fran has mounted solo exhibitions at the Fox Talbot Museum, Lacock Abbey, England, The Pucker Gallery (Boston), and Open Shutter Gallery (Colorado). She has won significant top prizes: the 2013 Julia Margaret Cameron International First Prize in Fine Art Photography, the 2012 Px3 Prix de la Photographie (Gold, Silver, and First Prize in three different categories), where her work was on exhibit in Paris. In 2011, she was one of 30 Americans invited to exhibit at the 2nd Biennial International Photographic Cultural Festival in Lishui and other venues in China. Also in 2011, she won Second Prize (among over 8,000 entries) from the Worldwide Photography Gala in the Portraits category. In 2010 and 2008, she won first place, second place, and an honorable mention at the International Photography Awards, and an Honorable Mention at the Julia Margaret Cameron awards. In 2010, 2008, and in 2007, she was a winner in PX3 Prix de la Photographie Paris, their People’s Choice award, and Adobe Photoworkshop.com. She has been a Critical Mass Finalist for four consecutive years. Her work appears in many journals, online blogs, several art books, and adorns the covers of many books. She is represented by Pucker Gallery (Boston), AfterImage Gallery (Dallas), Susan Spiritus Gallery (Newport Beach, California), and Photo Méthode (Austin, Texas). She is a Resident Scholar at the Women’s Studies Research Center at Brandeis, a recipient of several grants and artist residencies, and teaches digital collage at various colleges in Boston. It’s those in-between moments that always fascinate me. Neither coming or going, neither child-like or aged, neither predator or prey, neither darkest night or mid-day sun. I’m caught by life’s discrepancies between the conventional and the unknown. And I’m drawn to the paradoxes and contradictions in our everyday lives. I try to make connections between discontinuity and chance encounters, crafting some semblance of order out of the chaos and random events that truly govern us all, despite our inclination and obsessive need to assume there is a natural harmony in the universe. My constructed images fuse photographs with painting, and multiple fragments of my photographs are reassembled in the service of story-telling, just as fragments from imagination and memory are reconstructed into dreams. By placing seemingly disparate or unexpected objects into a formal context, I hope—at least temporarily—to create an illusion of order and harmony. My images blur the boundaries between the real and the unknown, the mundane and the beautiful, the intentional and the spontaneous. I acknowledge the connection between past and present—human and non-human life, interior and exterior spaces—literally and metaphorically. And my work is informed by the fact that you can’t have light without its constant companion, shadow.